Subsidiary lights and indicators are used to provide additional aspects and also to change the way a signal is interpreted. This page documents these subsidiary lights. 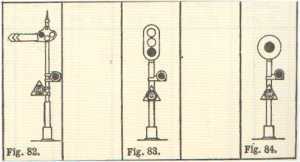 Diagram of Low Speed Grade signal from the 1943 Rule Book. 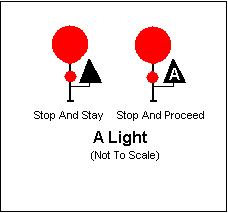 When an illuminated letter "A" is displayed on a Stop and Stay signal the signal concerned will become a Stop and Proceed signal and the rules and regulations applicable to Stop and Proceed signals become applicable to it. At some locations the A-lights also detect the points. "A" lights are also provided on Intermediate Stop and Stay signals protecting points and crossover roads at double-line switch-locked sidings. 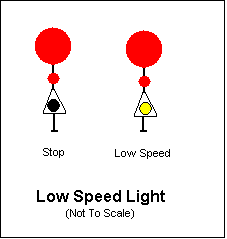 "A" lights are described in detail in my A-Lights page and more information about Stop & Proceed signals on the Signal Classification page. A short-range steady Yellow light when at "Proceed" but normally does not show any light. Proceed cautiously at Low Speed. Low speed is 25 kph maximum. Prepare to find the track occupied or obstructed. A train may pass an illuminated low-speed light without stopping. 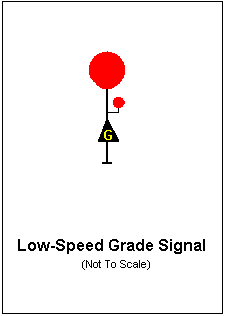 More information on Low Speed signals is given on my Permissive Working page. Proceed cautiously at Low Speed. Be able to stop short of an obstruction within half the distance of clear line that is visible ahead. Not to exceed 40 km/h. the movement into the block section is to follow the previously cleared movement, and the block direction is also in the same direction. Block open light from the opposing end of Block section is not available. An illuminated "E" is used at Waikanae to indicate that the route is set to an electrified road. Waikanae is the NIMT terminus of the 1500V DC electrification. The "L" (Low Speed to Loop) light is used on Arrival Signals in Single Line Automatic (SLA) and Track Warrant areas. 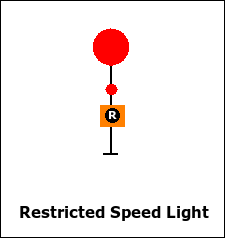 The "L" light illuminated means "route is set for the loop at low speed". Introduced in the 1943 Rule Book but was not in the 1965 Rule Book. According to the book Semaphore To CTC there is no known installation of a Grade Signal. Where a Low-speed Grade signal is provided, the Enginedriver of a goods train may pass the Stop and Proceed signal at "Stop" without stopping, and proceed at a speed not exceeding six miles per hour to the next fixed signal, being prepared to find the section obstructed by a train, or by one of the conditions in clause (a) hereof. If the top unit and the Marker are vertically aligned the signal is Stop & Proceed. 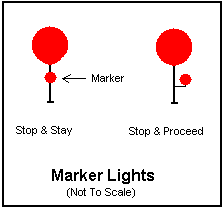 If the Marker is offset to the right the signal is Stop & Stay. See my Markers page for more detail. 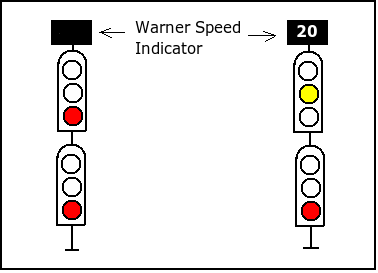 Warner Speed Indicators are fitted above the top signal unit on each mast. When illuminated, the Warner Speed Indicator will display a speed in km/h that any train passing that signal must not exceed until the next signal in advance is reached. When a restricted speed is to be displayed, the respective signal will not clear to proceed until the train is under sufficient speed control. 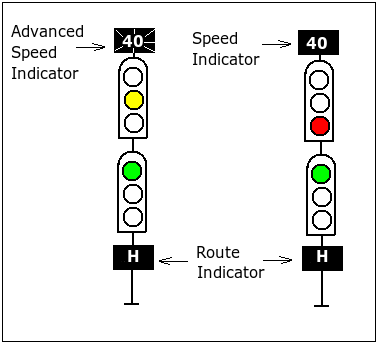 These indicators are provided to allow a train to approach the next signal when the overrun distance is reduced due to another train being signalled simultaneously. Advanced Speed Indicators when illuminated will display a flashing white speed in km/h that the train must not exceed at the next signal in advance. Speed Indicators when illuminated, will display a steady white speed in km/h that any train passing that signal must not exceed until clear of all points to which the signal applies. An alphanumeric display that indicates the set route. The route can be to a location e.g. T(awa) or H(utt) or to a signal e.g. 47 directing signal at the Wellington throat.